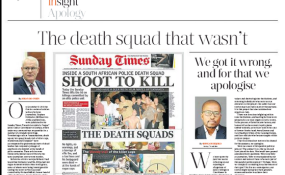 Although the South African National Editors' Forum (Sanef) applauds the Sunday Times for owning up to its "serious editorial lapses", the forum has acknowledged the "devastating impact" the reports have had on many people's lives. On Tuesday, Sanef met with Tiso Blackstar management to discuss the series of inaccurate reports on the Cato Manor death squad, the illegal deportation of Zimbabweans and the South African Revenue Service "rogue unit". "While Sanef welcomes the Sunday Times apologies, we acknowledge that the breaches of editorial standards have undermined public trust spreading beyond the publication itself, undermining the credibility of journalism for the public good," Sanef said in a statement. Sanef added that the controversy was an opportunity for media houses to "seriously introspect and review editorial systems to ensure that this debacle is not repeated". It has also committed to institute an independent investigation into issues of editorial integrity, the details of which will be communicated at a later stage. A major training campaign on media ethics for journalists has also been planned. The fallout at the Sunday Times has reignited debate around the establishment of a media appeals tribunal that was initially proposed by the ANC in 2010. "Sanef reiterates its opposition to a state-controlled system to regulate the media because of its inherent danger to media freedom," Sanef said. "We have opted for the Press Council, which is now an independent, co-regulation system, headed by retired judges. We believe the council has proved effective with a quicker process of adjudication than that of the courts. Also, it is a cheaper process." All three rulings can be found on the Press Council's website. Sanef is also concerned by allegations that there are journalists receiving bribes from newsmakers to stop them from publishing certain stories. "This is in violation of the press code that binds journalists to practice ethical journalism at all times, reporting the truth and being motivated only by the public interest," Sanef said. "We hereby call on all those with credible information and evidence of journalists accepting bribes to approach the public advocate at the Press Council, Joe Latakgomo, immediately."